(Nanowerk News) Lawrence Livermore researchers have identified electrical charge-induced changes in the structure and bonding of graphitic carbon electrodes that may one day affect the way energy is stored. Recent work by an LLNL-led team developed a new X-ray adsorption spectroscopy capability that is tightly coupled with a modeling effort to provide key information about how the structure and bonding of graphitic carbon supercapacitor electrodes are affected by polarization of the electrode - electrolyte interfaces during charging. Graphitic supercapacitors are ideal model systems to probe interfacial phenomena because they are relatively chemically stable, extensively characterized experimentally and theoretically and are interesting technologically. 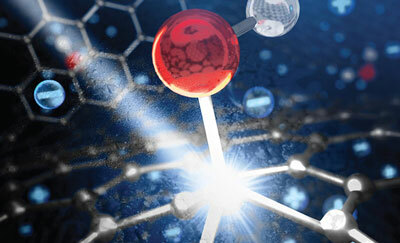 The team used its recently developed 3D nanographene (3D-NG) bulk electrode material as a model graphitic material. "Our newly developed X-ray adsorption spectroscopy capability allowed us to detect the complex, electric-field induced changes in electronic structure that graphene-based supercapacitor electrodes undergo during operation. Analysis of these changes provided information on how the structure and bonding of the electrodes evolve during charging and discharging," said Jonathan Lee, an LLNL scientist and corresponding author of a paper scheduled to appear as the cover article of the March 4 edition of the journal, Advanced Materials ("Potential-Induced Electronic Structure Changes in Supercapacitor Electrodes Observed by In Operando Soft X-Ray Spectroscopy"). "The integration of unique modeling capabilities for studying the charged electrode-electrolyte interface played a crucial role in our interpretation of the experimental data." Discovering that the electronic structure of graphitic carbon supercapacitor electrodes can be tailored by charge-induced electrode-electrolyte interactions opens a new window toward more efficient electrochemical energy storage systems. In addition, the experimental and modeling techniques developed during the research are readily applicable to other energy storage materials and technologies.